Scarring Acne Removal at Specialist Skin Clinic Cardiff Bristol..
Acne is a common skin condition and can be present on the face, back, neck and chest. 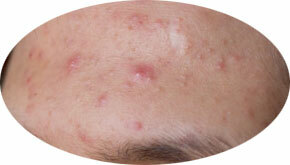 Though the appearance of acne can fade on its own, in some individuals acne scarring can occur. Acne scarring can affect your self-esteem and confidence. Laser technology can be used to reduce the visibility of acne scarring for those affected. This type of acne scarring treatment is a common way to improve the appearance of scars. To Get rid of all your acne scarring worries. Contact the Expert Dermatologist at the Specialist Skin Clinic for a consultation to find the Best suitable treatment for your acne scarring removal procedure adapted to your specific skin type. Acne is a skin condition commonly seen in people in their teens or early twenties, although in some cases acne can last considerably longer. Blackheads, whiteheads and spots are characteristics of acne and can cause acne scarring.Acne scarring can last after the skin condition has cleared up. Acne scarring can be treated with the use of laser technology. Laser treatment involves beaming light at the affected area to lessen its appearance. After a few laser treatments the appearance of acne scarring can lesson and the skin’s condition can dramatically improve. Several acne scarring treatments are required at regular intervals for the best results. Further acne scarring treatments may be needed following this to achieve maximum results. As with all laser skin treatments, acne scarring treatment is performed by one of our qualified practitioners and supervised by Doctor Maria Gonzalez. How much is acne scar removal treatment? Exact prices to be confirmed during your medical consultation for your Acne Scarring Removal Treatment.